Boston Public Schools Chief of Operations John Hanlon (left) and BPS Facilities Management employees Brenden Tong, Maria Carvalho, Katherine Walsh, Jeff Lane, and P.J. Preskins accept an award for managing lead levels in water at the State House on Tuesday. After several years and thousands of dollars spent toward combating high lead levels in school water fountains, the Boston Public Schools have been named one of the most proactive districts in Massachusetts for testing drinking water. 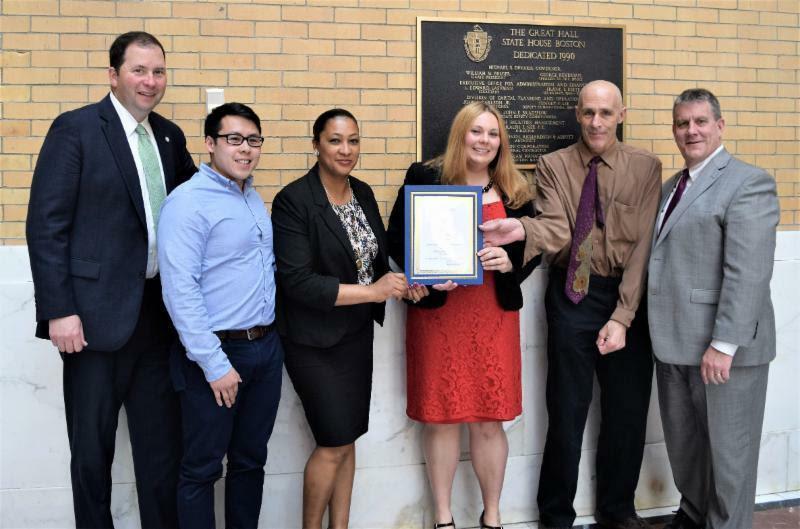 The Systems Taking Action to Reduce Lead award was given to BPS and the Boston Water and Sewer Commission by the Department of Environmental Protection at the State House Tuesday. BPS and the mayor’s office implemented a policy to test water in every working drinking fountain at least twice a year in 2016, according to a statement from BPS. The state only requires that districts test two schools per year. Just 34 schools in the district have working water fountains, while 98 use bottled water coolers due to concern over lead levels, BPS said. Any fountain that tests above 15 parts per billion of lead must be deactivated until the levels can be returned to a lower amount. During the 2013-14 school year, the city spent $411,000 to supply bottled water and cups to public schools, the Globe reported in 2015. The district began working to fix existing water fountains in the summer of 2015 as a part of a $300,000 project, but water from the newly installed fountains was found to have high lead content the following year, according to a Globe report. To combat the issue, the district budgeted about $41,000 in the 2017 fiscal year to equip new fountains with filters.